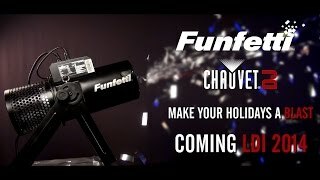 The Chauvet DJ Funfetti Shot is a professional confetti launcher and its easy, single person setup and operation make it perfect for perfect for concerts, parties or other special events. Just add confetti! No compressed air or CO2 required. The Funfetti Shot works with Funfetti Shot Refill - Color, Funfetti Shot Refill - Mirror, and Funfetti Shot Refill - UV, as well as most other confetti types. It is easily controlled from the display, the included wireless remote or DMX. The Funfetti Shot includes a double bracketed yoke for easy floor mounting or hanging on TRUSST and fits best in the CHS-50 VIP Gear Bag. 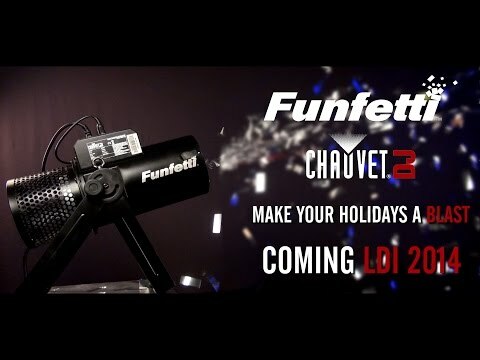 Considering purchasing the Chauvet Funfetti Shot? Have questions? Ask people who've recently bought one. Hi, does this include any shots ? Do you own the Chauvet Funfetti Shot? Why not write a review based on your experience with it. A great product that creates a hell of a mess. Beware of confetti shots, you don't need as much as you think and they are a killed to sweep up, but the effect is very good! I think this product is brillant! Great product which puts out a wide spray of confetti which is exactly what i needed at the events I take it to. Great fun and great effect. We used this to fire a load of poppies into the air for a remembrance event and it looked fantastic. great effect, really adds to my set up. Great product, remote control has great range also. Seen a video for Chauvet Funfetti Shot online or have you own video? Check out Chauvet Funfetti Shot on DJkit.com!